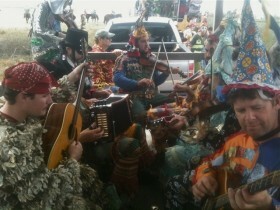 Tony Davoren's photo of the Mardis Gras created for the show Tremé. "Let's play spot the real Cajuns!" says Tony. Like my Mardis Gras: tangential, but with reality in it. I didn’t expect to be celebrating Mardis Gras, but it turned out to be a very fat day indeed. At the Dr. Glass office, where I crunch numbers for some fine people once a week, we celebrated Philip’s birthday/Mardis Gras/International Women’s Day with King Cake and pizza. While learning something about Disk Utility, I also learned that even after waking up happy I can still be reactive and testy. Another little lesson in humility, like a handful of Mardis Gras beads casually tossed out by the day, avidly grasped, easily forgotten and trampled—or treasured. At the studio Karen shares with me, I helped a student make the final choice between two fiddles, to live with over the coming years. She’s fifteen and her passion for the music knocks my socks off. Then, cancellations gave me a two-hour break. Karen’s face lit up when she heard that: “Do you want to eat with us?” ergh, I thought, I’d love to, but I was really looking forward to practicing. “We’re having pancakes for Shrove Tuesday, and mango lassi.” Well, how could I resist an offer like that!?! She’d meant to add vegetarian sausage, so I made a run to Trader Joe’s [Mardis Gras Run, suburban-Maryland-style**]. When I walked in, the muzak was cranking Shoo Fly Don’t Bother Me by The Wild Magnolias, and since it was Mardis Gras people smiled instead of looking away in embarassment when I couldn’t help dancing through the aisles. Dinner with the family was wonderful—conversation about music, Gabe’s master class with Joseph Alessi, sweet and savory toppings and crunchy cucumbers and red peppers on the side. And everyone looked handsome in black clothing under the bright beads Karen gave us. The evening ended for me with three strong conversations, two by phone and one by e-mail [Paul Revere’s Ride, 20th-century-style]…clarity in one, laughter in the second, and so much heart in the third that I had to just sit there for a while breathing deep and taking it in before I could respond, and then I responded, and then by’mby it was no longer Mardis Gras. Ash Wednesday dawned gray and chill. The world is a mess, and I have new strength to care. As lagniappe: I love stairs (when they’re not on a machine) and I walked down the 15 flights from our hotel room at least 15 times (but only 5 times going up). Not the slightest sore muscle: crazy. Even my body was inspired by the energy of ASTA!